Posted on 9/14/2009, 7:32 am, by Craftastrophe Chicks, under Craftastrophe. This? This is the ultimate Craftastrophe. 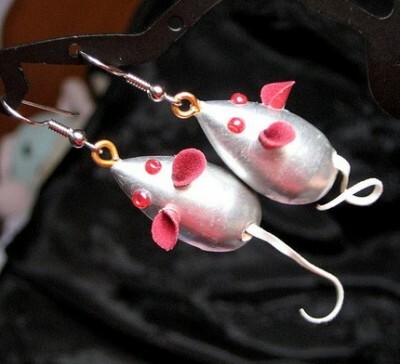 At first glance, they look like some pretty innocent, though heavy-looking earrings. Upon closer inspection though, I find offense with the red beady eyes, the oddly coloured ears and the thought of those tails tickling my shoulders a la Squirrel Feet Earrings makes my back teeth hurt. Combine all of that with these mice buttholes though and my back teeth scurry away! Yes Virginia, there is a real mouse on that pendant. No way! 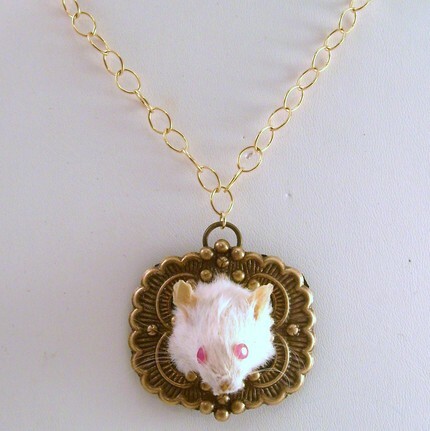 I love the taxidermy mouse necklace! Also love the squirrel feet earrings, tho they seem like they’d be scratchy on your neck. I’m probably a bit off-center, though. 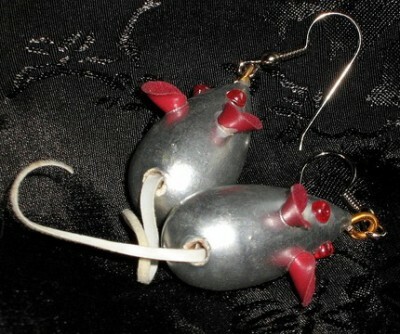 I do have earrings made from a friend’s wisdom teeth. OH! Ok, that’s reeeally nasty! I will say the only disturbance I have is the mouse head, but only because I’ve three little mice who are my dear babies. It’s just kinda macabre in my little book.